HID HUT is proud to introduce our new Activated Carbon Air Filter Line- the Carbon Cannons! The Carbon Cannon 1 is full to the brim of Virgin Activated Coconut Carbon, these filters knock out any smell. The Carbon Cannons are the most heavy duty carbon filters on the market- weighing in at 32 lbs- with over 25 lbs of carbon in every filter! The Carbon Canon 1 accomodates a 6" piece of ducting, or a 6" fan. They have a 2" carbon bed depth, are 1' tall and 10" round. 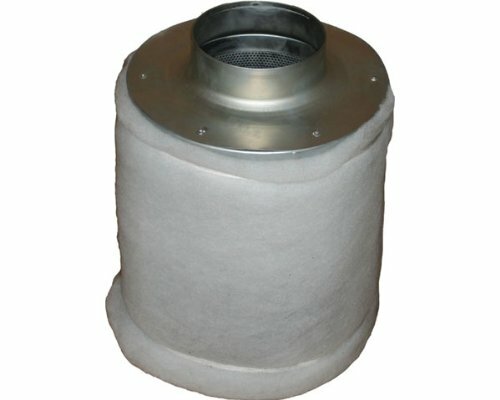 There is prefilter to keep dust out of the carbon. You can even refill the carbon when it is exhausted with our very inexpensive bulk carbon. The recommended flow rate is between 100 and 200 cfm for the Carbon Canon 1. Please also see our excellent deal on 25' sections of aluminum ducting, and bulk carbon to reload your Cannon!